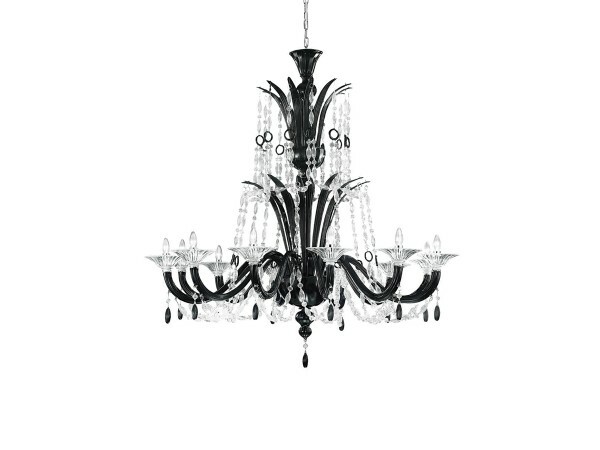 6009 K12 is a chandelier with a great aesthetic impact. A luxury work of art made in original Murano glass and perfect in every detail. Unique decorative applications in clear glass, match with the coloured frame, create a sparkle light show. Contact us today for more information. 6009 K12 is one of the most famous De Majo products. It belongs to the Tradizione series of Murano glass chandeliers with decorative clear glass drops that award it an air of luxury. The special feature about this chandeliers is beyond doubt its color scheme. Clear glass drops are combined with milk-white, black or red glass, depending on the luxurious colour you opt for. It is possible match the chandelier to the style of your living room.